The snow days have prompted one of my periodic withdrawals into ascetic seclusion. Solitude. Contemplation. Obsessive focus on effluvia; those hypothetical imponderables from which I try to educe the meaning and purpose of my life. For instance; I meant this to be a quick Tweet-length post but then used the word “hermetically” in the title and decided I should check the etymology to be certain it was what I meant and have now spent three hours researching and reading about Hermes and wondering why – today – I chose to use “hermetically” and what deep, synchronistic semiotical message I’m meant to glean from its eruption in my brain, that bubbling to the surface to explode onto my virtual page. I just wanted to say that I am feeling the need to hide. Again. Hermes: inventor of a magic seal, moving freely between worlds mortal and divine, protector and patron of wits, orators, makers of literature and poetry, protector of miscreants, harlots, and crones, arbiter of intelligence, bestower of the gift of eloquence to lovers, symbolically the gateway between the conscious and unconscious mind. Would that I could go there without the nagging sub-textual suspicion that my doing so is a ruse and pose meant to obfuscate the fact that I am a castaway, without a home or homeland, a wandering wastrel, pariah, leper, outcast. I’ve printed out the above (and below) photos of Hermes icons and paintings. 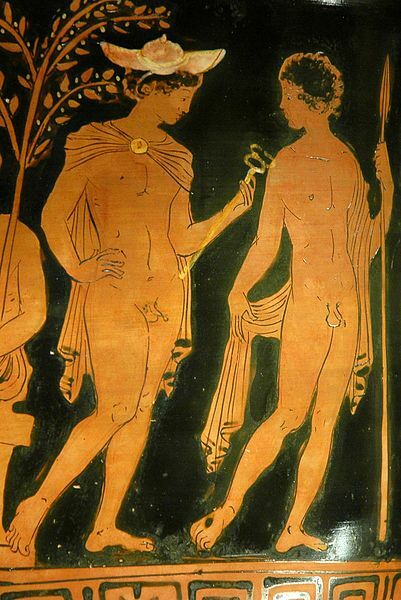 I am fascinated by the story of his obsessive love for the mortal young man, Krokus, and how while playing discus with him, and accidentally killing him with the intensity of his play, Hermes then turned him into a flower, the crocus. I have loved too intensely and destroyed as well; had I the sense to make the corpse of my emotions into flowers? I don’t know. In any event, Hermes and Crocus have been hung on my bulletin board, the one here in my writing alcove, the one full of shots of loved ones I personally know (and knew) and see (or once saw) and those loved ones the outlines of whom I admit to making up in my head – Joan Didion, Tennessee Williams, Jane and Paul Bowles, Little Edie Beale in her fur, William Burroughs on Jack Kerouac’s lap, etcetera. 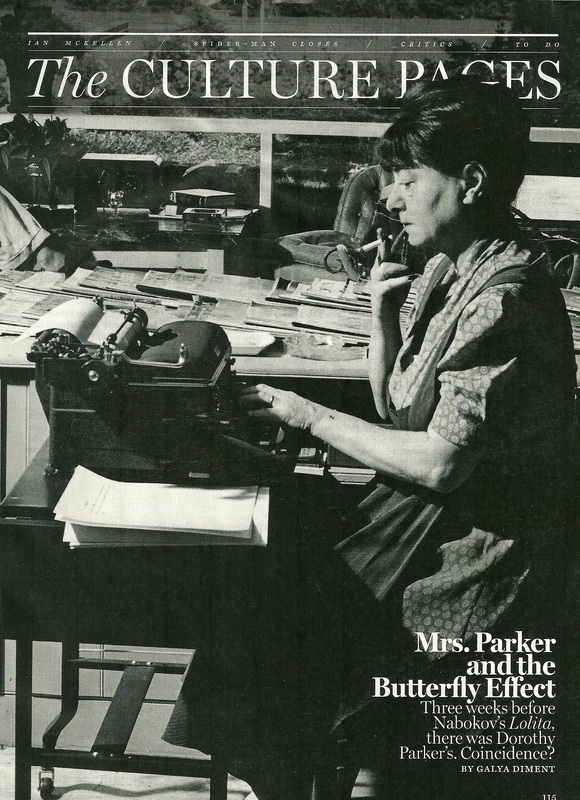 Already this week I had hung there a full-page from New York Magazine which boasted a photo of Dorothy Parker at her typewriter. This is why I re-subscribed to New York Magazine. (You should too. CLICK HERE. Their website is amazing as well.) Well, that and a pathetic hope that doing so would assure my winning the Publishers Clearing House Sweepstakes. It did not. And I was quite sad that day. When I did not hear from PCH. Or, from the latest literary agent to whom I had submitted things. The deadlines happened to fall on the same date. Yes, I am definitely hunkering down into isolation. Again. I need to confine myself to a separate place, a walled off room of my own in which the distractions of the daily and all those silly “real-life” rules and concerns – which I long ago learned were stratagems of deceit and subterfuge meant to keep us from noticing we were missing the point of life – do not apply. I will hide here, stay here, be alive here, with my pictures clipped from magazines and printed from offline. Like a fanpic worshipping youth slapping shots of hot musicians and actors, I hang these images of my idols – not that I’m above sticking up an image of a hot actor or musician – but, they tend to be long ago shots of those now dead. What was I talking about and where was I going? No idea, so, I’ll have to settle for here … where I am … NOT (today) going anywhere. I’m a satellite alone in my own universe.